The Columbia Center for the Arts is the community’s premier arts organization. For over 30 years, the Gallery has represented local artists in the Columbia River and is dedicated to bringing visual, performing, and literary arts to the region. 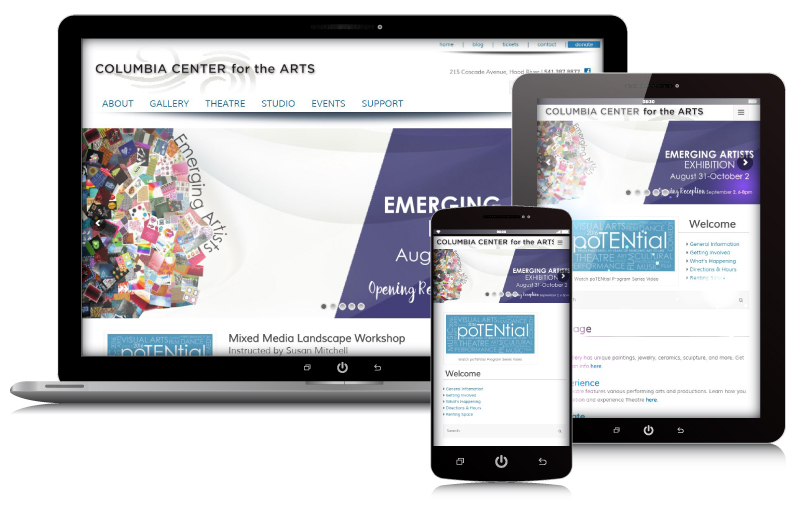 WebRock was contracted to build a new responsive website for Center that features an art gallery, black-box theatre, classes, and a broad array of artistic compositions. We provided an appearance that reflected the beauty of the area and captured the magnificence of the artists. The site has an updated look with management capabilities for company staff to change content as well as their schedule of the events and shows. WebRock designed a new manageable web presence that’s design was then also used for collateral print items, including presentation folders, letterhead and ads. © 2019 WebRock Design All Rights Reserved.